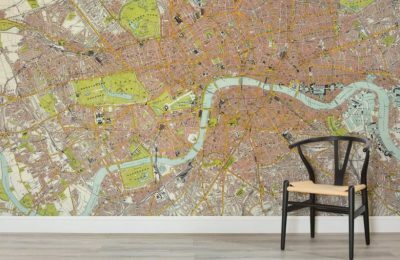 This intricately replicated and enlarged to scale map print wallpaper will lead you back to the EastEnd of London regardless of where you are. If you have East End ambitions and a trendy flat in suburbia then this print was made for you. Another print for the Patriots; this map has been overlaid with the London Skyline and features depictions of some of the City’s achievements. With the Union Jack incorporated into the design, you really need no more declarations of loyalty. 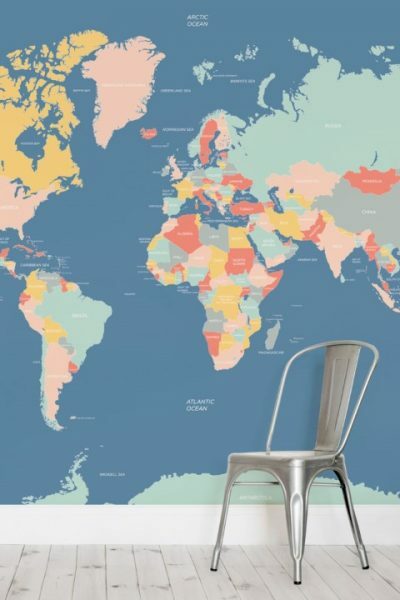 This charming design brings a fresh take to the world of map print wallpaper. Instead of continents marked out by terrain – they are marked out with the animals native to those continents. 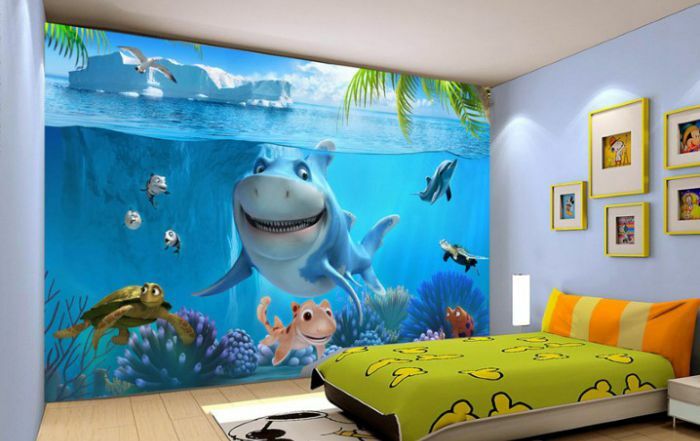 Perfect for a nursery where the youngsters can learn through fun. If you like the black and white colour scheme and want a map that stays true to its traditional form then this is the wallpaper for you. 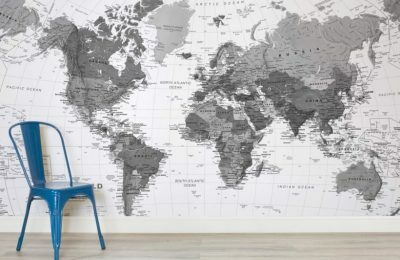 Our Monochromatic Map print will add a touch of geographical class to any area. 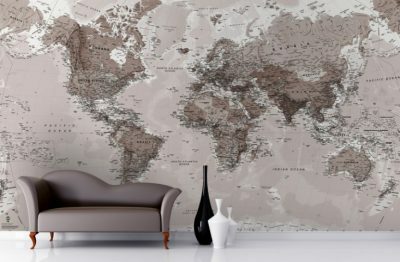 This print features the map of the world, only not as you know it. 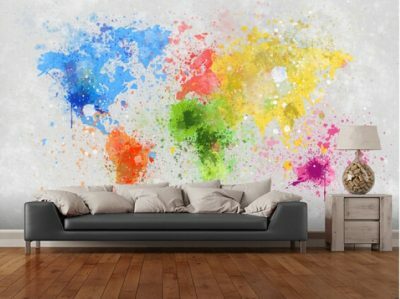 With bright colours making the continents really stand out, this printed wallpaper is ideal for a bright palette. 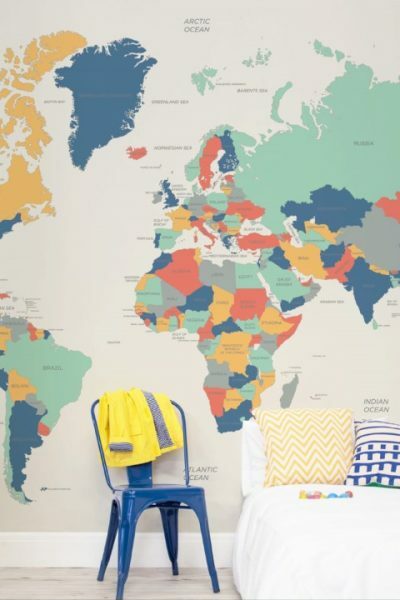 This vibrant take on the world map marks every continent’s borders in brightly defined colour that gives the whole wallpaper print a sort of High Definition edge. The map is laid on a white background, making the colours really pop. 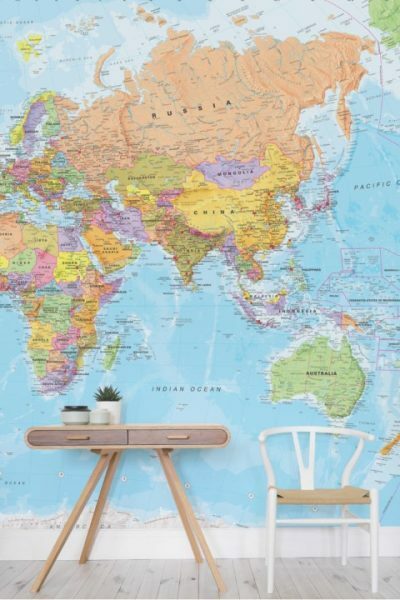 For any blue room, this map print is ideal. With a deeply defined ocean area, this map flips the traditional format on its head, putting the focus on the water and not on the land. Why not? Since two-thirds of the earth is effectively drowning. This beautifully illustrated map shows a close up of the East, with Russia and Australia on the same page and replicated in meticulous detail. Russia is picked out in a sort of Salmon pink that will suit a muted green or pale room. Ever wanted to see America in Pastel colours? Well, now you can! 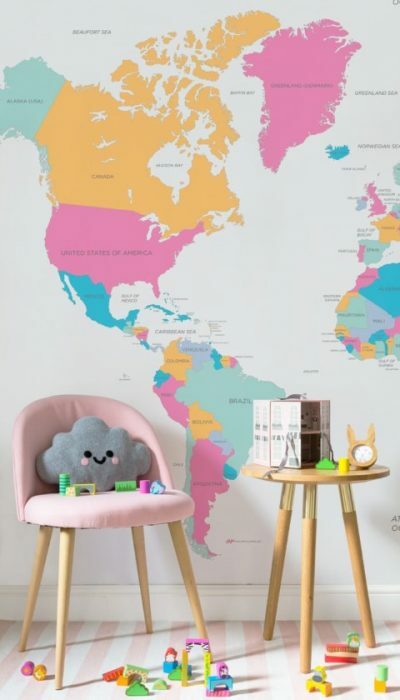 This refreshing and playful map is bound to brighten any dull room and bring a touch of life to even the darkest of walls. This Map has a purple hint to it, almost as if the original black and white map was retouched with a blue gel. The purple hue softens the normally hard edges of the world map and gives a sense of tranquillity in its place. For a basic map print that is not going to tax your intellect then this might be the answer. 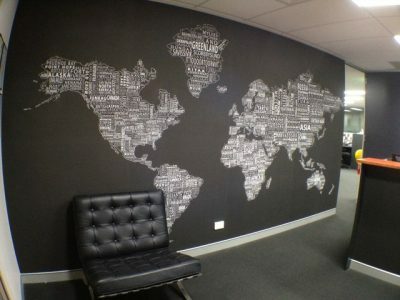 The map shows a black background with the outline of the continents drawn in white. Also in white are the names of the continents. 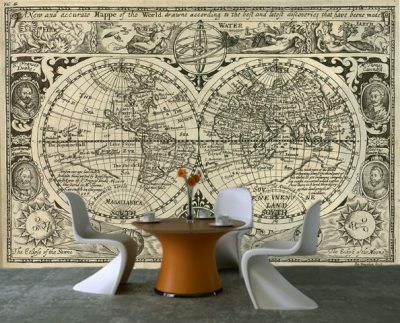 The Neo-Classical Map Wallpaper shows the earth as two globes, side to side and drawn as if on a cartographers copy. 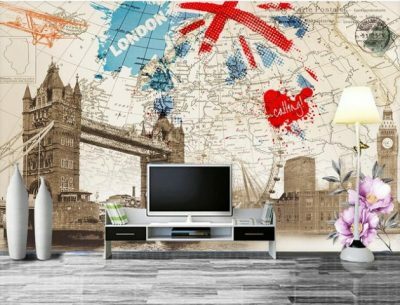 All around there are symbols and latitudinal lines – this map print wallpaper was designed for the truly romantic connoisseur. 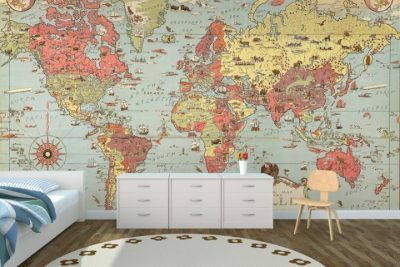 This truly unique, vibrant and ultra-modern take on the traditional map sports continents in full colour, without boundaries or clearly defined borders. This is a colourful artists impression of a map and is a firm favourite amongst the cultured. 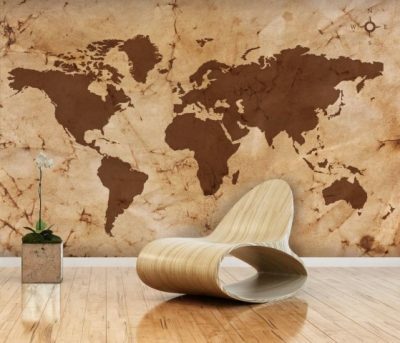 This Sepia touched map print wallpaper is ideal for a muted colour scheme, or for any room that you want to add an aged, classic feel too. 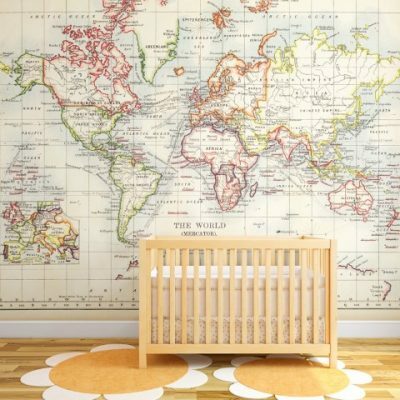 The print features the world map marked out on antique tinged wallpaper, giving it the overall semblance of wisdom. 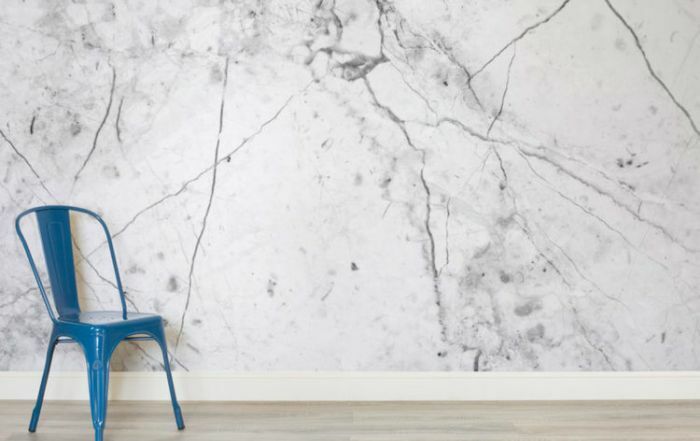 This icy feeling wallpaper might show the world in full, but it has a cool edge that is ideally suited to give the chill factor. 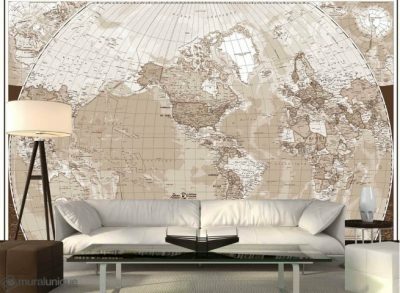 Perk up any room with this world map in full scale and lose yourself in the freezing white ocean. 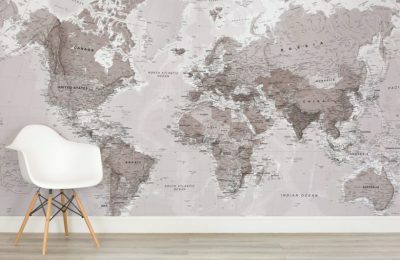 This map print wallpaper features the world map in subdued grey tones, making it ideal for any neutrally decorated space. When you want to darken things down and then tighten them back up again, choose our Gray Scale Map Wallpaper. 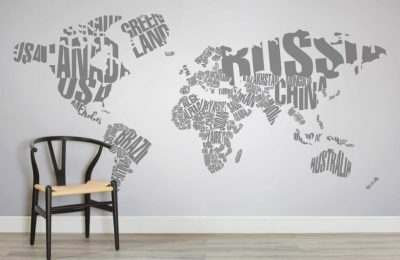 This curious feature wall map print wallpaper sports the whole world on the wall- with every country’s name picked out in an easy to read metallic print. Set on vertical stripes, this optical illusion wallpaper will have your guests thinking you did it yourself with nameplates! 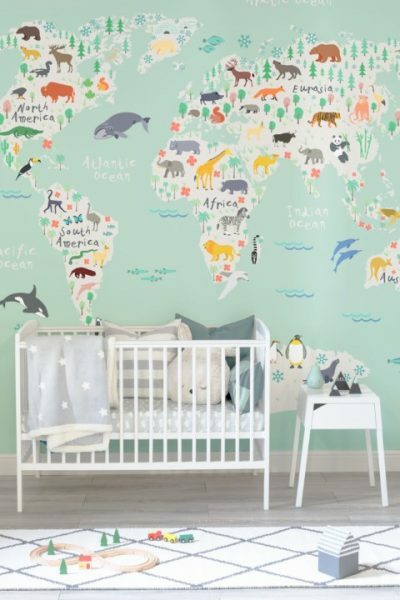 This chill blue-white ocean print features the continents shaped by the names of all the countries situated on them. The names are written in a funky script in cool grey, making this wallpaper at once serious and light-hearted. This print features a bright white background and ocean, with stark, dark lines representing the continents – all of which are geometrically cut into different types of triangle. 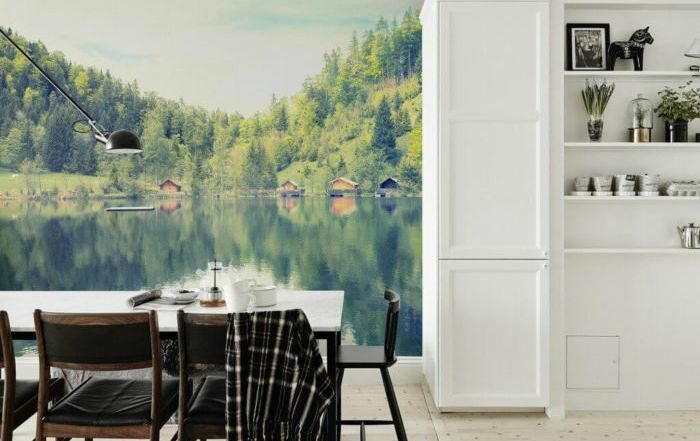 An interesting wallpaper that will provide a talking point in any room. 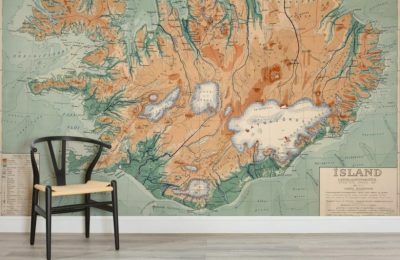 This map print mural wallpaper shows the density of land and sea via the clustering of dark colours, mountain ranges and shallows. 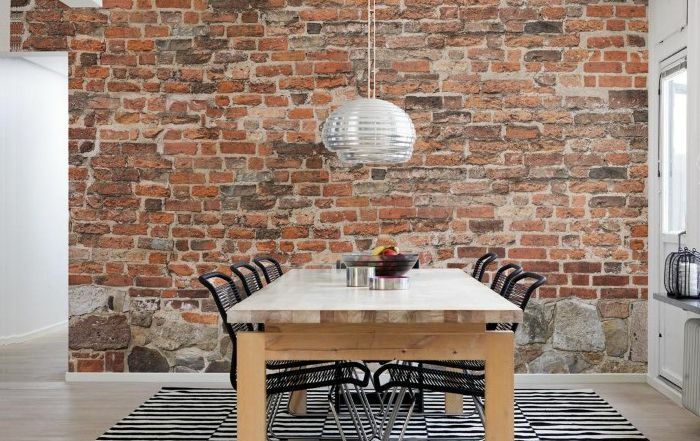 The subdued colour scheme adds a classy finish to any space and projects a serious air. 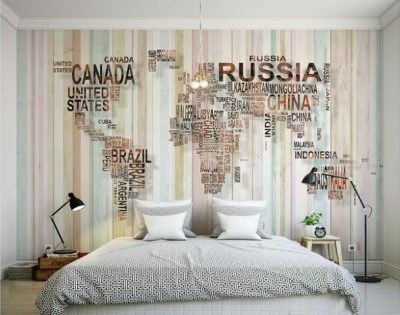 This bright and boisterous wallpaper shows the world map with all sorts of interesting bits and pieces picked out. It has boats, penguins, dolphins – anything the aspiring seaman (or woman) could wish for! The sea is white while the land is blue, reversed from a traditional map format. This map print really has a desert feel to it. You might expect to find such wallpaper on the inside of a Safari tent or decorating the walls of a far-flung airport. 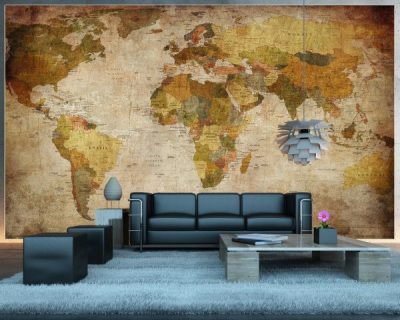 If ‘Arabian’ is your thing then this map print is perfect for you. 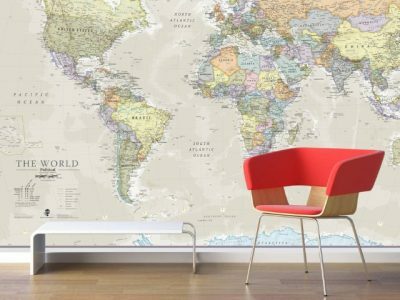 This map print mural wallpaper features the whole world with Britain at the center. It has curved lines around either edge to make the map look as if it were held in a globe. This is a traditional, if somewhat muted, map. 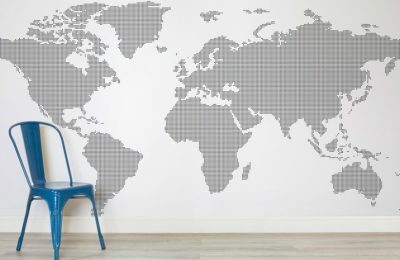 This dotted wallpaper sports the continents marked out in an almost tartan blueprint, with vertical and horizontal blue lines making up the continents and countries. An eye-popping number that will confuse even the cleverest brain. 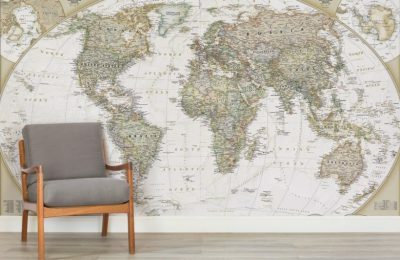 This map print wallpaper has larger oceans than most, a subdued, almost sepia hint of colour to it and has a light and breezy feel that will brighten up even the darkest of rooms. Ideal for a bathroom, kitchen, or library, and perfectly copied in minute detail. 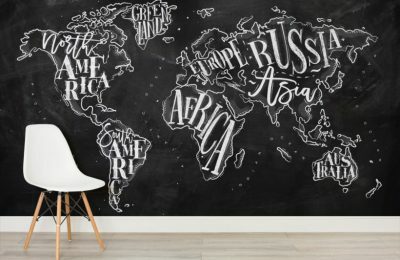 The Checkerboard Map print wallpaper sports the countries names outlined in fine white lettering on a plain black background that is guaranteed to match any colour palette. 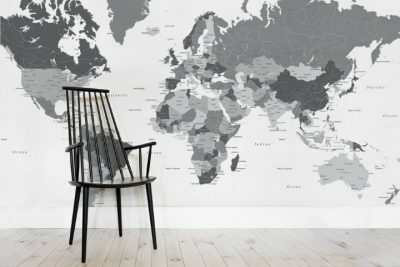 This map offers a high class and stylish take on a map print and is a favourite for Bachelor pads. 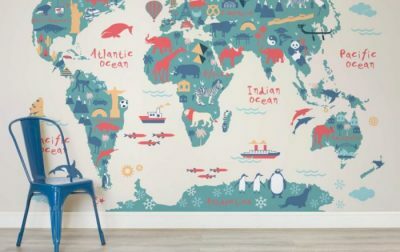 This vibrant and colourful map print wallpaper features each countries huntable animals picked out and painted in natural colouring. The background is a wash of blues, pinks, yellows and greens, and will be easy to match with furniture. This map shows a full scale and close up the island of Australia, and is perfect for Oz lovers everywhere. The colouring is green and pale blue, with the land shaded in varying hues of a faun, dependant on land density. 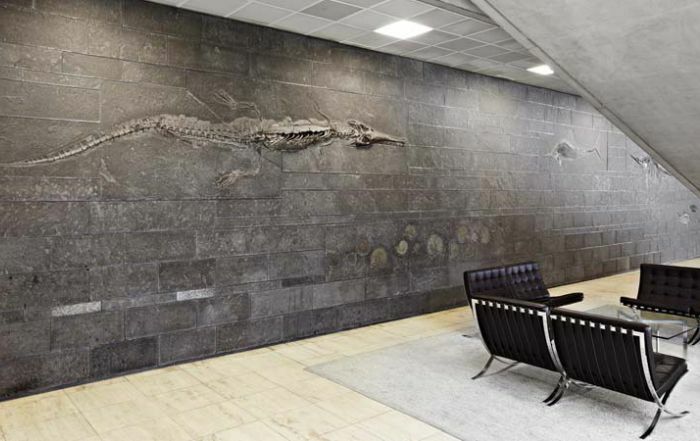 A firm feature wall favourite for all former backpackers. This map shows the streets of London immediately surrounding the River Thames. The colour scheme is a deep pink mixed with an amberish yellow, with the blue of the river cutting neatly through all. 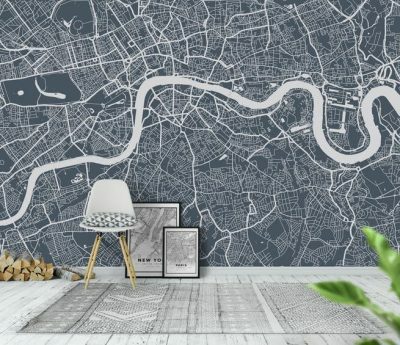 For all London lovers, this map will rock your walls. 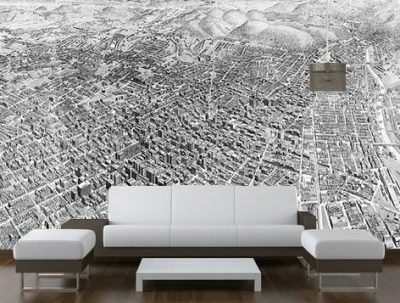 This wallpaper is black and white, and shows a city in profile and shot from above. It is not quite a skyline shot, more an angled piece where you can see the hills that frame the city in the background. A classy, black and white aerial shot. 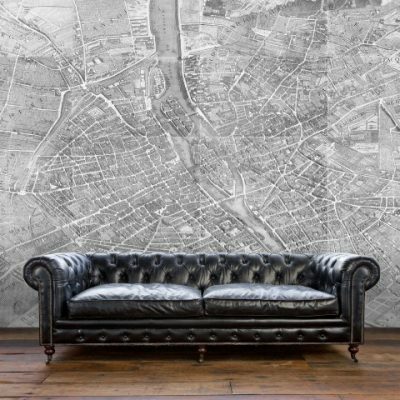 This print mural wallpaper shows an aerial shot of a city in monochromatic colour that is guaranteed to add appeal to any room. The black and white finish gives an aged effect and is the perfect wallpaper to frame antiques with.